The King and Prince Beach & Golf Resort hosted the Georgia Food Experience. 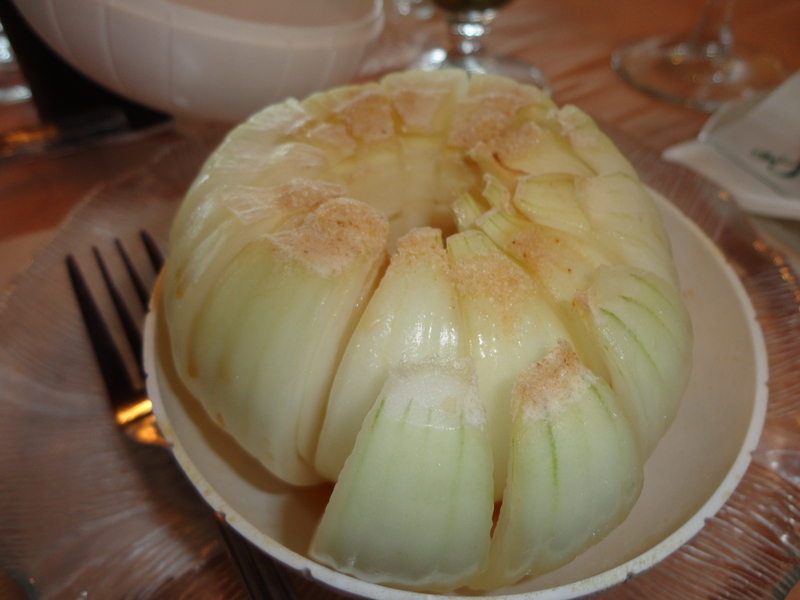 One of the presentations that offered a very beneficial taste test was a sampling of this sweet Vidalia onion cooked in a little onion shaped cooker with French Onion spices that made the onion taste like the best French Onion Soup a chef could offer. I tried this out at home with great success right in my very own microwave. While my kitchen needless to say does not have the ambience of the King & Prince’s lovely digs, the onion was as good when I replicated it as when I tried it out at when Sarah Bland exhibited how sweet these onions really taste. Did you know that to be called a Vidalia onion that the onion has to be grown in one of 20 southeastern Georgia counties? Sarah Bland of Bland Farms which is head-quartered in Glennville, Georgia, shared that this year the Vidalia’s were earlier than ever. I found it interesting that many of the Ansar Shriners sell the delectable onion as a fund raiser that brings in dollars to their hospitals accross the US. Bland Farms is the world’s largest year-round grower, packer, and shipper of sweet onions and the industry-recognized name for Vidalia® Sweet Onions. In fact, Bland Farms represents almost one-third of all Vidalia® onions marketed. Log onto their website for details at http://www.blandfarms.com!